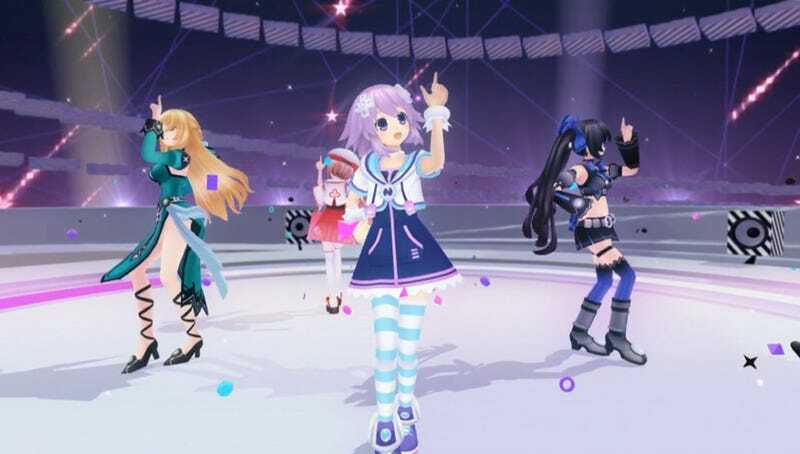 It’s looking to be a big summer for game industry parody series Neptunia—despite the worrisome event from a few weeks back. Not only is it getting its own anime and a remake of the original game on the Vita, but it also recently got a new spin-off game: God Dimension Idol Neptunia PP. When I spoke to the creator of Neptunia, Mizuno Naoko, at TGS last year, she told me that the reason she created Neptunia was to have cute transforming girls in a parody game about the game industry itself. If anything, Neptunia PP follows this mission statement perfectly. The game is chock full of all the game parody moments you'd expect from a game in this series. The dialogue is often witty and full of gamer-centric humor. My favorite such scene involved a problem I have had since I first started gaming—a long name. When making characters for a new game, the goddesses all try to recreate themselves. But when it comes time to enter their names, only Neptune's name is too long to enter, making her feel like the black sheep of the group. While it's probably not particularly funny to anyone who's never been in that situation, as someone who had that happen numerous times while growing up, I found myself chuckling at it. Past games in the series have taken pot shots at everything from the issues of piracy to the rise of portable consoles. Neptunia PP sets it sights on two targets: cellphone games and iDOLM@STER. When the forces of MOB48 (a pun on the idol group AKB48 and the Japanese word for mobile game) begin stealing interest away from the four game console countries, the four console goddesses must become pop idols themselves and save their world with the power of rock. From this framework, everything in iDOLM@STER is parodied—from the events and training the goddess has to do to the pseudo-romantic storylines between singer and manager. Speaking of the manager, you actually play as an iDOLM@STER fanboy, pulled into the world of Neptunia to be the goddesses’ producer because of your vast experience in the genre. In other words, you are basically playing an iDOLM@STER game about a guy who, while playing iDOLM@STER, is sucked into a game world where he needs to play iDOLM@STER. It's iDOLM@STER-ception. While there are only five songs total that are singable by your goddess in the game (one representing each goddess—though any of them can sing it—and one for the whole group to sing), there is actually much more music there than it seems at first glance. Like iDOLM@STER, each song is different depending on who is singing it. If your chosen goddess is Neptune, then she sings the song. If you chose Bell instead, she sings her version instead. Later in the game when you start to form a duo, the songs get remixed between the two versions—and when you form a trio, it is remixed yet again. There's even a special version of each song where the transformed goddess sings it in a completely different voice—despite the voice actor being the same. So despite there only being five songs, this variety makes them never really seem old. The actual concert gameplay while the goddess sings, however, is somewhere between confusing and downright terrible. Basically, as the producer, you have control over the camera and the stage's special effects—i.e., a fog machine, glitter, lasers, etc. Based on how well you edit together the show, your goddess will receive more fans. The problem is it’s nearly impossible to figure out what angle the crowd would enjoy. So in practice, you just end up cycling through the vast number of camera angles until you hear the crowd cheer for one, then you use a special effect to boost the crowd's reaction. But even then, it is difficult to score high enough to get a better result than if you did nothing at all. The only reliable way to get a good score is to transform your singer into her goddess form. The problem is that this can only be done when she is a solo artist (and not part of a group) and singing her theme song—thus undercutting the whole idea of having dynamic music changes depending on the singer. Really, there are only two gameplay aspects to this game. The first is choosing which stat to work on for the day, watching the event scene that follows, and occasionally making a dialogue choice that gives a bonus stat boost. The second is the (annoyingly flawed) concert production gameplay. This leaves Neptunia PP feeling sparse in comparison to the game it’s trying to parody. While the iDOLM@STER games also have event conversation and concert gameplay—though the concert gameplay is admittedly far different from Neptunia PP’s—the iDOLM@STER games are also peppered with minigames throughout to keep it interesting. Each stat you build has a different minigame and each night you play another random one with your idol members before they head home. These minigames really flesh out the overall game and Neptunia PP would have really benefited from a few more of its own. God Dimension Idol Neptunia PP is not a great game nor is it even a great iDOLM@STER clone. However, it is an enjoyable parody—which is probably the most important facet of a Neptunia game. So if you like the idea of mocking iDOLM@STER or are a fan of the characters and humor from other titles in the Neptunia series, you'll probably enjoy this game. If not, it's probably best you steer clear. God Dimension Idol Neptunia PP was released for the PlayStation Vita on June 20, 2013, in Japan. There is currently no word on an international release.